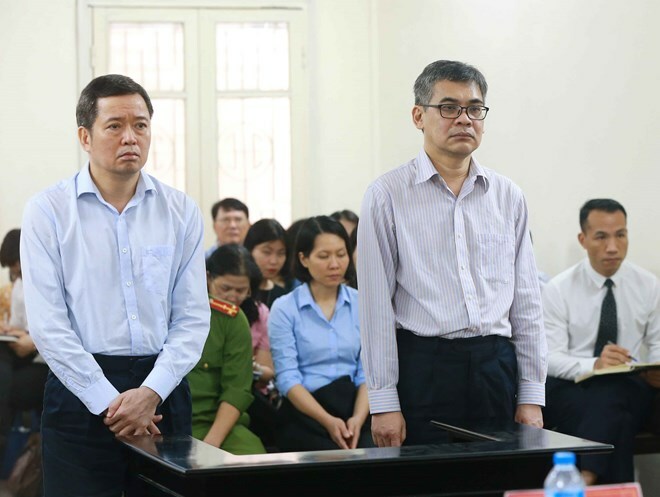 Hanoi (VNA) – Two former leaders of the Vietnam-Russia oil and gas joint venture Vietsovpetro have been given prison sentences for “abusing position and power to appropriate assets”. According to the verdict announced by the Hanoi People’s Court on March 22, Tu Thanh Nghia (born in 1962), former General Director of Vietsovpetro will have to spend three years and a half behind bars, while Vo Quang Huy (born in 1961), former Chief Accountant of Vietsovpetro will be imprisoned for seven years. The court said as leaders of Vietsovpetro, in 2013 and 2014, Huy and Nghia decided on the depositing of the firm’s money at the Ocean Commercial Joint Stock Bank (OceanBank). From July 2013 to 2014, Nghia signed 10 fixed-term VND deposit contracts involving 1.9 trillion VND and five fixed-term USD deposit contracts involving 55 million USD. As the Chief Accountant, Huy proposed the depositing and submitted all the contracts to then General Director Nghia to sign with OceanBank’s Vung Tau branch. To encourage the two to continue supporting Vietsovpetro’s depositing of money into OceanBank, the bank’s then General Director Nguyen Minh Thu paid them extra-interest that was not stated in contracts on many occasions. Huy and Nghia admitted they had received the money and used it for personal purposes. Nghia confirmed that he had been paid 1.5 billion VND and 30,000 USD by Thu. Meanwhile, the court said there is sufficient basis proving that Huy had received 2.7 billion VND and 70,000 USD from Thu although the procuracy charged him with having gained 5.2 billion USD and 130,000 USD. According to the verdict, while Huy held an important role in proposing the depositing and forms of deposit accounts, Nghia was the one who decided on and signed the deposit contracts. The nature and level of violations as well as the money appropriated by Huy were higher than Nghia’s, so the former Chief Accountant also has to bear greater criminal liability than that of the former General Director.